Brian Fargo has added a huge incentive to drive Wasteland 2 Kickstarter funding to even higher levels: Obsidian Entertainment. I'll get right to the point. If the Wasteland 2 Kickstarter, currently sitting at $1.65 million in funding, can reach $2.1 million before the clock hits zero in 17 days, development of the game will be joined by Obsidian Entertainment. How huge is that? Ridiculously so. Obsidian was formed by veterans of Black Isle Studios, whose logo you will see on games like Fallout, Icewind Dale, and Planescape: Torment, and which, as a division of Interplay, already has a long history with Fargo. 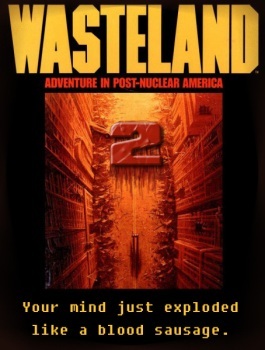 "Wasteland is one of my favorite RPGs of all time, and when Brian asked if I wanted to work on the sequel, I jumped at the chance," Obsidian CCO and Planescape: Torment Lead Designer Chris Avellone told Rock, Paper, Shotgun. "While I've worked on Fallout 2 and Fallout: New Vegas, getting the chance to work on the spiritual successor to the Fallout franchise is a honor." Fargo said that the addition of Obsidian will give the project access to "an incredible library of story, dialog and development tools" plus the experience to use them, which will help quicken the development process. The fact that this is probably as close as we're ever going to come to an Interplay/Black Isle reunion is a pretty big plus, too. It's obvious what needs to be done now. Wasteland 2 needs our money - all of it! Kickstarter.com, people. Let's make this happen.